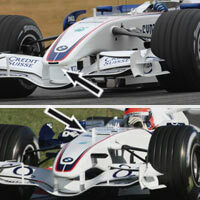 BMW Sauber have displayed a highly competitive pace during the winter season. 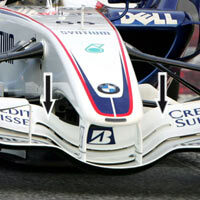 Quickly after the initial shakedown a new front wing was introduced that makes it hard to decide whether it has 2 or 3 horizontal planes. 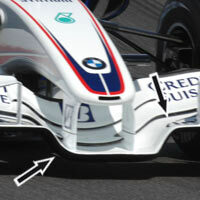 Yet again BMW Sauber have found a simple solution by making a cut into the upper - second - panel. 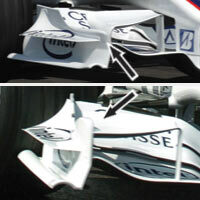 It is really impossible to predict the effect of this change although the extra split in the middle of the wing will increase the downforce and drag generated under the nose.